"Kunlun" redirects here. 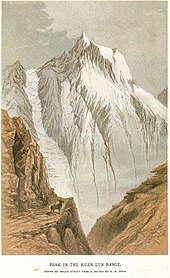 For the mythological mountain, see Kunlun (mythology). For other uses, see Kunlun (disambiguation). The Kunlun Mountains (simplified Chinese: 昆仑山; traditional Chinese: 崑崙山; pinyin: Kūnlún Shān, pronounced [kʰu̯ə́nlu̯ə̌n ʂán]; Mongolian: Хөндлөн Уулс, Khöndlön Uuls; Uyghur: كۇئېنلۇن تاغ تىزمىسى‎) are one of the longest mountain chains in Asia, extending more than 3,000 kilometres (1,900 mi). In the broadest sense, the chain forms the northern edge of the Tibetan Plateau south of the Tarim Basin. The exact definition of this range varies. An old source uses Kunlun to mean the mountain belt that runs across the center of China, that is, Kunlun in the narrow sense: Altyn Tagh along with the Qilian and Qin Mountains. A recent source has the Kunlun range forming most of the south side of the Tarim Basin and then continuing east south of the Altyn Tagh. Sima Qian (Records of the Grand Historian, scroll 123) says that Emperor Wu of Han sent men to find the source of the Yellow River and gave the name Kunlun to the mountains at its source. The name seems to have originated as a semi-mythical location in the classical Chinese text Classic of Mountains and Seas. From the Pamirs of Tajikistan, it runs east along the border between Xinjiang and Tibet autonomous regions to the Sino-Tibetan ranges in Qinghai province. It stretches along the southern edge of what is now called the Tarim Basin, the infamous Takla Makan or "sand-buried houses" desert, and the Gobi Desert. A number of important rivers flow from it including the Karakash River ('Black Jade River') and the Yurungkash River ('White Jade River'), which flow through the Khotan Oasis into the Taklamakan Desert. Altyn-Tagh or Altun Range is one of the chief northern ranges of the Kunlun. Its northeastern extension Qilian Shan is another main northern range of the Kunlun. In the south main extension is the Min Shan. Bayan Har Mountains, a southern branch of the Kunlun Mountains, forms the watershed between the catchment basins of China's two longest rivers, the Yangtze River and the Yellow River. The highest mountain of the Kunlun Shan is the Kunlun Goddess (7,167 m) in the Keriya area in western Kunlun Shan. Some authorities claim that the Kunlun extends further northwest-wards as far as Kongur Tagh (7,649 m) and the famous Muztagh Ata (7,546 m). But these mountains are physically much more closely linked to the Pamir group (ancient Mount Imeon). The Arka Tagh (Arch Mountain) is in the center of the Kunlun Shan; its highest points are Ulugh Muztagh (6,973 m) and Bukadaban Feng (6,860 m). In the eastern Kunlun Shan the highest peaks are Yuzhu Peak (6,224 m) and Dradullungshong (6,282 m); the latter is the eastern major peak in Kunlun Shan range and is thus considered as the eastern edge of Kunlun Shan range. The mountain range formed at the northern edges of the Cimmerian Plate during its collision, in the Late Triassic, with Siberia, which resulted in the closing of the Paleo-Tethys Ocean. The range has very few roads and in its 3,000 km length is crossed by only two. In the west, Highway 219 traverses the range en route from Yecheng, Xinjiang to Lhatse, Tibet. Further east, Highway 109 crosses between Lhasa and Golmud. Over 70 volcanic cones form the Kunlun Volcanic Group. They are not volcanic mountains, but cones. As such, they are not counted among the world volcanic mountain peaks. The group, however, musters the heights of 5,808 metres (19,055 ft) above sea level (35°30′N 80°12′E﻿ / ﻿35.5°N 80.2°E﻿ / 35.5; 80.2). If they were considered volcanic mountains, they would constitute the highest volcano in Asia and China and second highest in the Eastern Hemisphere (after Mount Kilimanjaro) and one of Volcanic Seven Summits by elevation. (Mount Damavand is the highest volcano in Asia, not the Kunlun cones.) The last known eruption in the volcanic group was on May 27, 1951. Kunlun is originally the name of a mythical mountain believed to be a Taoist paradise. The first to visit this paradise was, according to the legends, King Mu (976-922 BCE) of the Zhou Dynasty. He supposedly discovered there the Jade Palace of the Yellow Emperor, the mythical originator of Chinese culture, and met Hsi Wang Mu (Xi Wang Mu), the 'Spirit Mother of the West' usually called the 'Queen Mother of the West', who was the object of an ancient religious cult which reached its peak in the Han Dynasty, and also had her mythical abode in these mountains. 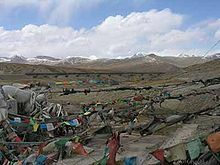 The Kunlun mountains (spelled "Kuen-Lun" in the book) are described as the location of the Shangri-La monastery in the 1933 novel Lost Horizon by English writer James Hilton. The mountains are the site of the fictional city of K'un Lun in the Marvel Comics Iron Fist series and the TV show of the same name. ^ "Kunlun Mountains". Encyclopædia Britannica. Retrieved 2009-11-19. ^ "Kunlun Volcanic Group". Global Volcanism Program. Smithsonian Institution. Retrieved 2014-03-15. ^ Young, Sage (March 16, 2017). "What Is K'un-Lun In 'Iron Fist'? The "Lost City" Has A Mystical History". www.bustle.com. Bustle Digital Group. Retrieved November 19, 2018. It's located in the Kunlun Mountains in Tibet, which is a real Chinese mountain range. Munro-Hay, Stuart Aksum. Edinburgh: University Press. 1991. ISBN 0-7486-0106-6. Wikimedia Commons has media related to Kunlun Mountains. This page was last edited on 23 January 2019, at 12:29 (UTC).